GhostTownsUSA's GPS specialist, James O’Brien, confirming the location of a geo cache. Boom Towns & Relic Hunters “Geo Relic Treasure Cache” is designed for the sole purpose of educating anyone in the history of Okanogan country. Our Geo-caching treasures represent a piece of history from yesteryear and are a wonderful way for students and family to learn more about the history of this unique part of Washington State. This is accomplished when teaming up with family members or groups in order to become Geo-cachers. 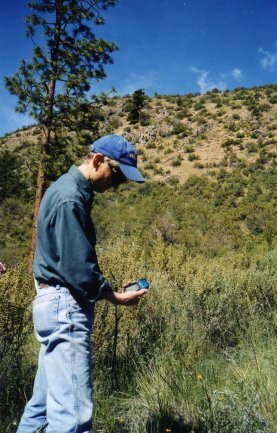 Geo-caching is a great way to spend a vacation or a weekend trip away wandering the roads of Okanogan country in search of the history of yesteryear and to relive some of Washington’s history. Many of our treasures will be located in areas having to do with ghost towns, mining camps, legendary million-dollar mines, vanished boomtowns, and the history of Okanogan County. Boom Towns & Relic Hunters “Geo Relic Treasure Cache” will transport you back in time while exploring and searching for relics from the past. Probe the secrets of these “Relic Caches” as well as the clues they offer to extraordinary pioneer and mining days dating back one hundred years or more. In most cases our treasures or “relics” represent a piece of history from the past. Our artifacts have either been unearthed or discovered by Jerry’s Boom Towns & Relic Hunter’s team of experts who have spent many years in the hobby of metal detecting while exploring this historic part of Washington State. In addition, we will include some written history regarding our “Geo Relic Treasure Cache”. These relics are your keepsakes / rewards for taking the time to explore and learn more about historic Washington State. Please share your newly found artifacts and your Boom Towns & Relic Hunters treasure cache stories with other history buffs. If you are lucky and discover our “Geo Relic Treasure Cache” then please have your photo taken at the historic treasure site. Send us the photo and we will post it on our website here at GhostTownsUSA.com. For those planning a trip to the area, and clues to our “Geo Relic Treasure Caches” please log onto GhostTownsUSA.com for more research information on where to locate such treasured relics from the past. Please don’t forget to include a copy of Boom Towns & Relic Hunters of Northeastern Washington State in your vehicle. This can be taken along as a personal history reference guide when arriving at our “Geo Relic Treasure Cache”. Our book will explain the detailed history of the area you are visiting while conducting your historic treasure hunt. You can purchase our book or DVD through this website. It is also available for purchase at Amazon.com or Barnes & Noble. Are you new to Geo-caching? In order to get started in Geo-caching visit www.geocaching.com for complete answers to your questions about this growing hobby. 1. Please replace our cached relic(s) with one of your relic(s), which represents a piece of history or some other item or event from the past. No junk, please! 2. A couple suggestions for caching treasures: One could hide old coin(s), square nail(s), or any old artifact(s) over fifty years old. In most cases the treasure containers that we will utilize will be not much larger then an old Mason canning jar or smaller than an old cork-top medicine bottle. 3. Try your chance at winning a free Boom Towns & Relic Hunters limited edition T-Shirt. After returning home from your historic Wild West treasure hunt please take the time to sign our guest book on our website and let us know what you thought of your Geo-caching treasure adventure with Boom Towns & Relic Hunters. By signing our guest book register after each treasure hunt you will be eligible for our monthly drawing. There will be no tablets or pencils available in our “Geo Relic Treasure Caches”. “No Trespassing,” “Keep Out,” “Posted, Private Property,” “Historic Site.” Such signs are often all-too-common for those who would seek out and search the grounds of ghost towns and mining sites. The best advice would be to FOLLOW POSTED SIGN WARNINGS, and DO NOT TRESPASS. Any and all associates or partners of Boom Towns & Relic Hunters “Geo Relic Treasure Cache”, their agents, volunteers, or employees or those affiliated with the website do not endorse, condone, or suggest illegal trespassing on private property. We do not accept liability for those who trespass onto lands posted “DO NOT TRESPASS,” whether posted or not. I Will Respect private property and do no Geo-caching without the owner’s permission. I Will appreciate and protect our heritage of natural resources, wildlife, and private property. I Will use thoughtfulness, consideration, and courtesy at all times. I Will remove and properly dispose of trash that I find. I Will respect private and public property, all historical and archeological sites, and will do no Geo-caching on these lands without proper permission when posted. I Will keep informed on and obey all laws, regulations, and rules governing federal, state, and local public lands. I Will observe the “Golden Rule,” using outdoor manners and conducting myself at all times in a manner that will add to the stature and public image of all people engaged in the field of Geo-caching. I Will not destroy property, buildings, or what is left of ghost towns and deserted historical structures. I Will not tamper with signs, structural facilities, or equipment. I Will increase public awareness of Geo-caching. geocaching.com They discuss the "how to". garmin.com There are basic manuals to download free - one good one on "how to geocache". rei.com Nationwide listing of stores and events/clinics.